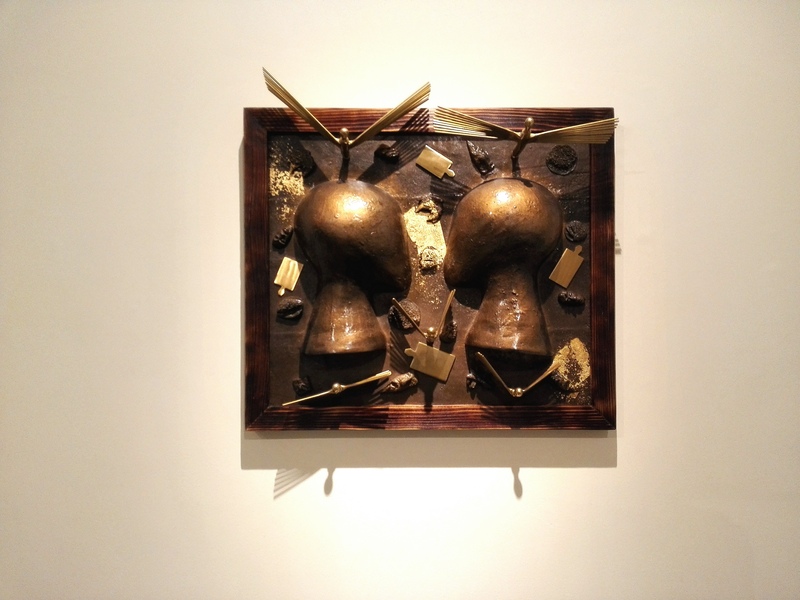 Several decades into his career, artist Abdul Jabbar Gull presents a new body of work exploring his sculptural practice. A solo show titled “Thoughts from the Celestial Realm” opened at Koel gallery on January 8, 2019. 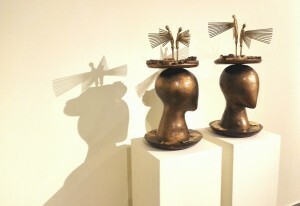 Gull has been working with the medium of metal and wood in his sculptures for majority of his career. Faceless, yet resembling a human silhouette, his golden winged metal pieces have become almost characteristic of his own individual aesthetic as an artist. The thought behind his winged sculptures resonate from his childhood experiences of being curious and inquisitive, looking at everything from fragile innocence. He describes the wings as depicting his own imagination and thoughts, constantly moving and inspiring him. He incorporates the human figure extensively in this body of work, amalgamating the wings with faceless human silhouettes. Several pieces hung from the ceiling are elevated, resembling a wind-chime. The linear metallic rods descending downwards depict movement while remaining static. We also see inverted versions of the same thing, in which the linear rods are instead facing upwards from a wooden base, almost as if they had burst through the ground. While the winged golden figure is present in almost every piece, Gull explores each metallic structure differently, playing with their presence in physical space. Some pieces lay on the ground, while others were installed from the ceiling to hang in mid-air. Similarly, while some were created resembling a wall, others were framed and hung against the wall itself. Vertical panels of wood are also displayed parallel to each other, with a metallic grid-like frame and the winged pieces perched on top. Geometric shapes take on an important role in his work. Skeletons of cubes and pyramids are often repeated, almost trying to constrain the free-spirited nature of the winged pieces attached to them. The structured uniformity of the geometric framing is broken because of the unconventional disorder of the winged figures. 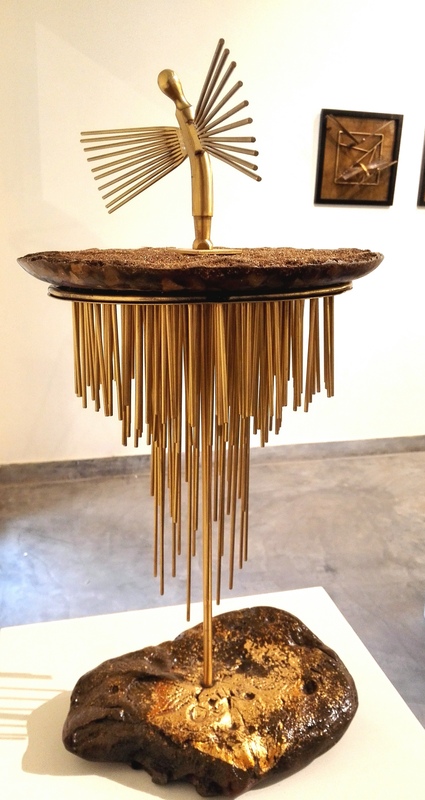 A golden waterfall of weaved metal also stands vertically, framed together with wood. In another piece, we see the winged figure almost gliding down the frame, facing towards the ground as the metallic weaves leads the way. The silhouette of a faceless, mannequin-like human head is also used in several pieces. Resting atop are the winged figures. Here, we see a literal display of how he sees his thoughts as flying on “delicate wings of imagination”. Several figures are placed together in a group, while some remain in individual spaces. We also see some pieces where the two winged figures face each other, standing atop an uneven, rocky base. Several pieces are made standing erect on top of flat, pan-like bases. Surrounding the gold piece, we see pieces of charred metal, resembling burnt coal. Gull states that at the center of everything, he seeks inspiration from human experiences and emotions, saying that he wants to “express their common sufferings, grief, and relationships on individual and collective levels”. Each figure, though identical and faceless, represents a different version of human experience, encapsulating an entirely different emotion with each piece. Gull creates a deeply personal yet relatable body of work that seeks to explore spirituality and consciousness in a humanistic manner. Though mostly geometric and structured, his pieces rely on the winged figures to capture the essence of free thought and strength of the human spirit.